39.5 x 54cm (L*H) Approx. 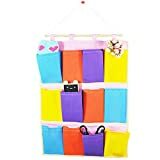 This entry was posted in Home Decor Supplies and tagged Bags, Door, Hanging, Home, iTemer, Multicolored, Organiser, Pockets, Storage, Tidy, Wall by 4logis. Bookmark the permalink.